As is usually the case, overnight implied volatility has spiked ahead of the central bank meeting, irrespective of the fact that most expect rates to remain unchanged at 1.75%. Still, it remains prudent to assume volatility could spike in the event of new or unexpected information. CPI expected to rise to around the 2% mid-point target – but there are upside and downside risks to this outlook. OCR to remain at expansionary level for a considerable time. February’s statement remained neutral and we don’t see a material reason for RBNZ to drop their neutral stance tomorrow looking at data since then. Furthermore, there’s a strong and logical argument to be made that RBNZ could wait until May’s OCR meeting to make any changes as this is the first meeting the MPC (monetary policy committee) get involved. Today we’ll look at EUR/NZD as its decline has stalled above key support ahead of tomorrow’s RBNZ meeting. 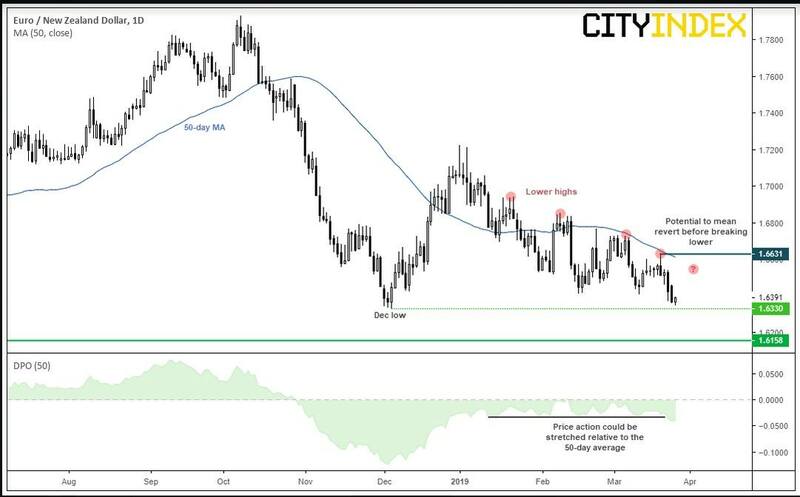 With economic data mostly focussed around the US today, we think it’s likely that EUR/NZD could hold above the December low leading up to the meeting. A bounce from current levels seems plausible given the significance of December’s low. Furthermore, prices appear a little extended from the 50-day average, so mean reversion could be on the cards before its next leg lower. However, given the series of lower highs which have been capped by the declining 50-day average, we suspect an eventual break below 1.6330 is on the cards for a run towards 1.6158. Ultimately though, this could hinge around RBNZ’s ability to surprise markets tomorrow.